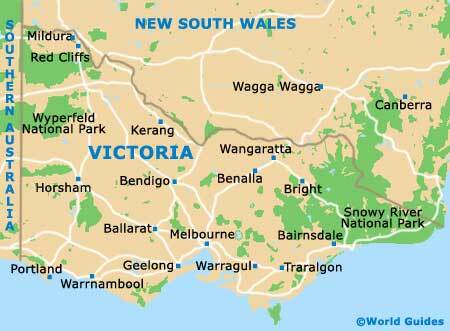 Victoria isn't the largest of Australia's states, but there is certainly plenty going on here. Around three-quarters of the folk who live here choose to live in Melbourne. This great metropolis has more tourist attractions than you could ever hope to cover in one holiday, particularly if you get distracted by the city's shops. The best way to get your bearings in Melbourne is to take a trip to Skydeck 88, situated at the top of the Eureka Tower, the city's tallest building. Outside of Melbourne there is much remoteness, occupied by around 14 million sheep, five million lambs and a considerable number of beef and dairy cattle. Vast quantities of grain are grown here, along with fruit and vegetables. Victoria has a long stretch of coastline and lots of beaches. Taking a trip along the Great Ocean Road isn't as scary as it used to be when it was a single-lane highway, although reports of the occasional collapse of overhanging cliffs can be unnerving. Along the coast in the quaintly named area of Surf Coast Shire, Bells Beach is home to the world's oldest surfing competition. Some of the top surf businesses, including Rip Curl, have their headquarters in nearby Torquay. Head away from the coast and all that wild surf and you can have a very different sort of fun in the mountains. In the winter, the Victorian Alps are the playground for Victoria's skiers, while in the summer, horse riding and hiking top the list of things to do. In its heyday, you didn't come to Victoria to get fit; you came to get rich. The historic former boom town of Beechworth lies at the heart of the Goldfields region of Victoria. It is still drawing in the crowds today, with its authentic buildings and fascinating glimpses into the Kelly Gang legend.